A bucket list type trip for sure! The Galapagos islands were truly mesmerizing. 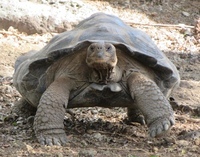 They were remote, unspoiled, filled with animals (many endemic to Galapagos) and the scenery was over the top. We chose Silver Seas as it had great ratings and we wanted a slightly larger ship with very experienced naturalists. While the ship holds about 100 people, I think we only had about 85 on board and it never felt crowded. Silver Seas has this down pat! From the moment you arrive at the airport, it is well organized and orchestrated. You never felt rushed or like you were part of a herd. Each experience was personalized and the staff and crew were very polite, respectful and helpful. Each day, you wake up early and head out for excursions. Most days, there were options to choose from. Each excursion started in a zodiac and you headed out to explore an island, snorkel, kayak or visit a small town. Each zodiac had a guide who lead you through the excursion and ensured each guest got the most out of it. The animals are a highlight of the whole trip. They are not afraid of people and you get a very up close (but not too close) experience with sea lions, birds, iguanas, fish and so much more. The ship itself was very nice. Rooms were spacious (for a cruise ship) and well appointed. Your personal butler ensured you had everything you needed and was quick to respond to any special request. Every time we left the room, they came in and cleaned and straightened it up. The ship wasn&apos;t new but well kept up. There was only one restaurant and the Grill on board. We had breakfast at the restaurant buffet each morning and chose to have lunch in the Grill on the deck of floor 5. We alternated between the Grill and main restaurant for dinner. The food was very good in both. I do think they could expand the Grill dinner menu beyond on the hot rocks as it was fun the first night and then got a little old. The restaurant food was all excellent and what I would expect at a fine dining establishment. Our fellow travelers were generally 40-60&apos;ish years old and liked a very active vacation. There is little time to rest during the week. You could choose to skip excursions but then why go on this trip? It was action packed and crazy busy but exactly what we expected. There was only 1 child on our trip and about 10 teenagers who seemed to really enjoy it. Most people were part of bigger (6-12 people) groups which included families, siblings, multi generational, friends, etc. One word of warning which Silver Seas is clear about - this is not a trip for anyone that is mobility challenged. The ship isn&apos;t set up for it and the excursions all require you to go up and down steep steps on a rocking ship to the zodiac and often disembark in to the ocean and walk ashore to hike on a rugged trail. There is no entertainment on the ship other than a small piano bar for pre-dinner cocktails while watching the sunset. Most people were in their cabins by 10pm resting up for another big day of excursions. Overall, this was a once-in-a-lifetime trip although we may go back again one day and see the Western part of the archipelago. Also, we chose March as the seas were warmer for snorkeling although the air temperature was very warm too. It is the rainy season, but we didn&apos;t see even a drop of rainy and it was sunny each day. 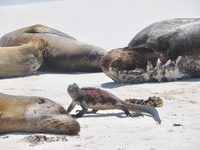 Can&apos;t recommend this trip on the Silver Galapagos highly enough! 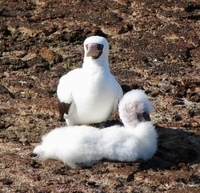 Blue Footed Booby - very funny to watch them dance! 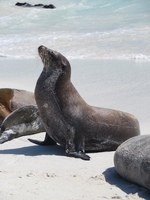 Sea lions were very entertaining! Beautiful ship traveling amazing islands! A bucket list type trip for sure! The Galapagos islands were truly mesmerizing. 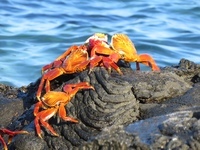 They were remote, unspoiled, filled with animals (many endemic to Galapagos) and the scenery was over the top. We chose Silver Seas as it had great ratings and we wanted a slightly larger ship with very experienced naturalists. While the ship holds about 100 people, I think we only had about 85 on board and it never felt crowded. Silver Seas has this down pat! From the moment you arrive at the airport, it is well organized and orchestrated. You never felt rushed or like you were part of a herd. Each experience was personalized and the staff and crew were very polite, respectful and helpful. Each day, you wake up early and head out for excursions. Most days, there were options to choose from. Each excursion started in a zodiac and you headed out to explore an island, snorkel, kayak or visit a small town. Each zodiac had a guide who lead you through the excursion and ensured each guest got the most out of it. The animals are a highlight of the whole trip. They are not afraid of people and you get a very up close (but not too close) experience with sea lions, birds, iguanas, fish and so much more. The ship itself was very nice. Rooms were spacious (for a cruise ship) and well appointed. Your personal butler ensured you had everything you needed and was quick to respond to any special request. Every time we left the room, they came in and cleaned and straightened it up. The ship wasn&apos;t new but well kept up. There was only one restaurant and the Grill on board. We had breakfast at the restaurant buffet each morning and chose to have lunch in the Grill on the deck of floor 5. We alternated between the Grill and main restaurant for dinner. The food was very good in both. I do think they could expand the Grill dinner menu beyond on the hot rocks as it was fun the first night and then got a little old. The restaurant food was all excellent and what I would expect at a fine dining establishment. Our fellow travelers were generally 40-60&apos;ish years old and liked a very active vacation. There is little time to rest during the week. You could choose to skip excursions but then why go on this trip? It was action packed and crazy busy but exactly what we expected. There was only 1 child on our trip and about 10 teenagers who seemed to really enjoy it. Most people were part of bigger (6-12 people) groups which included families, siblings, multi generational, friends, etc. One word of warning which Silver Seas is clear about - this is not a trip for anyone that is mobility challenged. The ship isn&apos;t set up for it and the excursions all require you to go up and down steep steps on a rocking ship to the zodiac and often disembark in to the ocean and walk ashore to hike on a rugged trail. There is no entertainment on the ship other than a small piano bar for pre-dinner cocktails while watching the sunset. Most people were in their cabins by 10pm resting up for another big day of excursions. Overall, this was a once-in-a-lifetime trip although we may go back again one day and see the Western part of the archipelago. Also, we chose March as the seas were warmer for snorkeling although the air temperature was very warm too. It is the rainy season, but we didn&apos;t see even a drop of rainy and it was sunny each day. 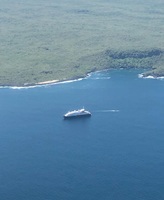 Can&apos;t recommend this trip on the Silver Galapagos highly enough! Definitely get a balcony room. It was a tad dated, but well appointed. It isn&apos;t a huge balcony but nice to sit outside or watch for sea turtles, sharks and more as you were moving from one island to the next.